CBO on Obamacare: People won’t be as desperate for work, and nobody’s going to lose their job. Republicans and the media are badly distorting a new CBO study on health care and the labor market. 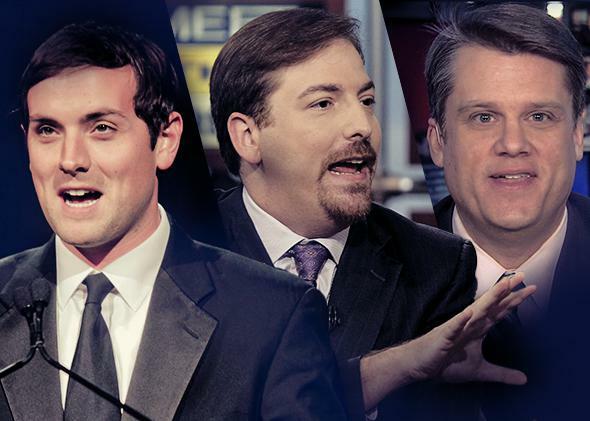 Journalists Luke Russert, Chuck Todd, and Ben White all cited the Congressional Budget Office report as a devastating blow to the Obama administration. They’re wrong. Photo illustration by Lisa Larson-Walker. Photos by Getty Images, CNBC. Imagine Bill Gates decided to do something very eccentric and give $1 million to every man, woman, and child living in Hancock County, Maine. That wouldn’t be a particularly savvy use of his charitable dollars, but he could afford it if he wanted to and still have billions to spare. What would happen next? Well, after a bunch of crazy celebrations it stands to reason that quite a lot of people would quit their jobs. After all, while working can be fulfilling, it can also be a chore. Nobody with a million bucks in her pocket is going to want to work at the Ellsworth Wendy’s or wake up at 4 a.m. to go lobstering. Over time, obviously, the regional economy would adjust. Some people would move away. Some would shift into other jobs. Other folks would move to the newly prosperous Hancock County. But among the 54,000 or so people who live there, employment would take a permanent hit. Maybe. Or maybe you’re just explaining. Explaining, for example, that while the CBO did estimate that Obamacare implementation will lead to 2 million–2.5 million fewer full-time equivalent jobs than would otherwise exist, those jobs would be lost on the supply-side rather than the demand-side. To see the difference, go back to Hancock County. In the wake of the Gates giveaway, employment isn’t falling there because nobody wants to buy lobster or lunch or get the plumbing fixed. If anything, the demand for workers will go up since there are more people in town with cash in their pockets to spend. But employment is going to go down because the supply of people interested in jobs—especially lower-paying or less-pleasant jobs—is going to tumble. The ACA will have a similar benefit through two main mechanisms. One is that by making it possible to get health insurance without a full-time job, it simply makes full-time employment less desirable. Pre-ACA, the government heavily subsidized job-based health insurance, in a way that made it broadly accessible, but lacked equivalent mechanisms to create a workable risk pool for people buying insurance on the individual market. The ACA fixes that with its exchanges and the dread individual mandate, so it’s easier for a person to retire early or to take a part-time job while going to school or working on the great American novel. The other is that by directing subsidies to low-income people, the ACA makes working longer hours less desirable. Right now, some people work two jobs to make ends meet. The ACA makes it more financially feasible for those people to quit one job and rely on subsidies (or Medicaid) to help fill the gap. Employment may decline, in other words, not because people are going to get fired but because people will be pickier about working. Some are going to be unhappy about this. Owners of Wendy’s franchises, for example, will either need to pay more to recruit workers or invest in some kind of labor-saving technology. That’s true thanks to the ACA, just as it would be true if Gates gave everyone a million bucks. The difference is that if everyone in your community got a financial windfall, that would be unambiguously good news; the overall impact of Obamacare, however, is hotly disputed. Its proponents are optimistic that it can increase the efficiency of the health care system, slow the growth in costs, and create a healthier society and a higher-wage economy. Its detractors say this is bunk, that it will stifle innovation while doing little to improve the health of its beneficiaries. This is an important debate that will continue for years. Who’s right about it will ultimately determine whether the law is a boon or a disaster. But the mere fact that it will lead to less labor supply is really neither here nor there. Any useful safety net program—Social Security, say—decreases labor supply by making people better off. For that matter, prosperity itself reduces labor supply. People used to work six days a week rather than five, but we don’t anymore because we’re richer and can afford more time off. If the latest news from the CBO changes our thinking about anything, it should be about the status quo that prevailed as of last year. If Obamacare really does cause millions of people to voluntarily leave full-time employment, that shows us how much avoidable suffering the earlier system was causing. Not just in terms of the problems faced by the actually uninsured but by the hidden cost of keeping people locked into jobs for fear of losing coverage.